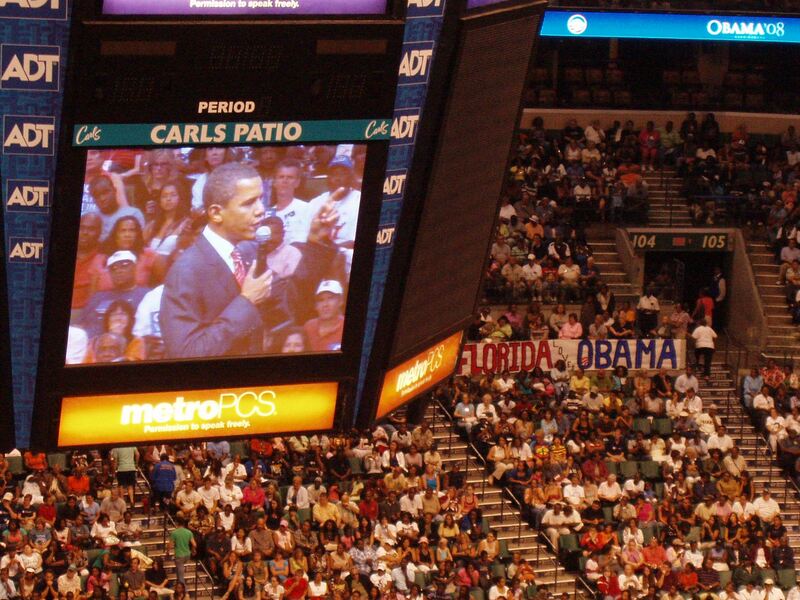 Today’s appearance at the Bank Atlantic Center in Sunrise, Florida for Barack Obama can be summed up in one sentence. Scheduled to start at 3:30 pm, we were first teased with U.S.Rep. Robert Wexler (D-Delray Beach) and Broward Commissioner Stacy Ritter at 4:00 pm. 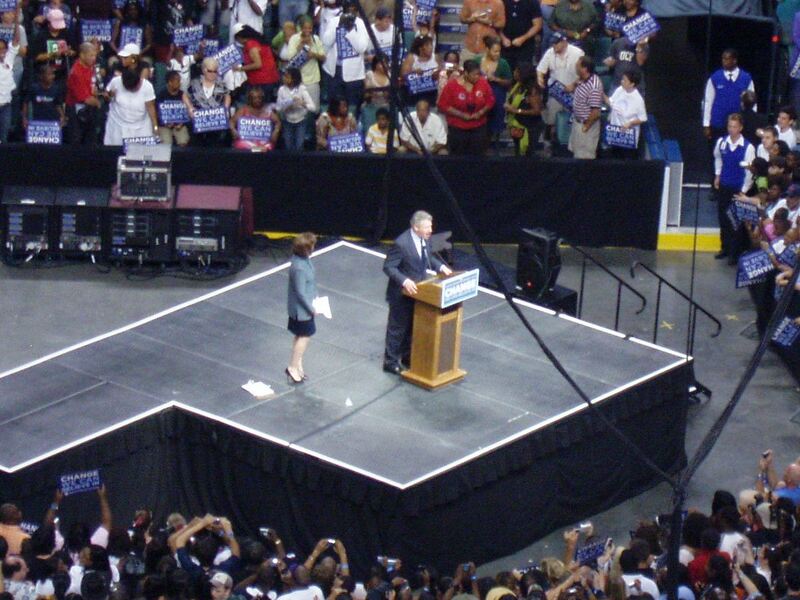 Wexler, who was a very early endorser of Obama charged up the crowd and introduced Ritter. She told a couple of stories of the early, struggling days of the Obama campaign. As she completed her speech, she began to announce Obama as the next pre sident of the United States and just as she got to his name, she stopped saying that she is being told to drag it out. After a 5 minute delay, Ritter said that the next time she came out would be to introduce the next president and then they walked off. me pretty good. I can safely say that I had never been frisked like that, except by my wife. We found a seat in the upper deck by about 3:20 and a band was performing down by the stage. We watched them hand out signs to the crowd and tried to take our minds off of the fact that we were sopping wet. I can safely say that if I was at rock show or a ballgame that we inexplicably delayed over an hour, I’d be pretty perturbed. The amazing thing was that everyone was happy to be there. 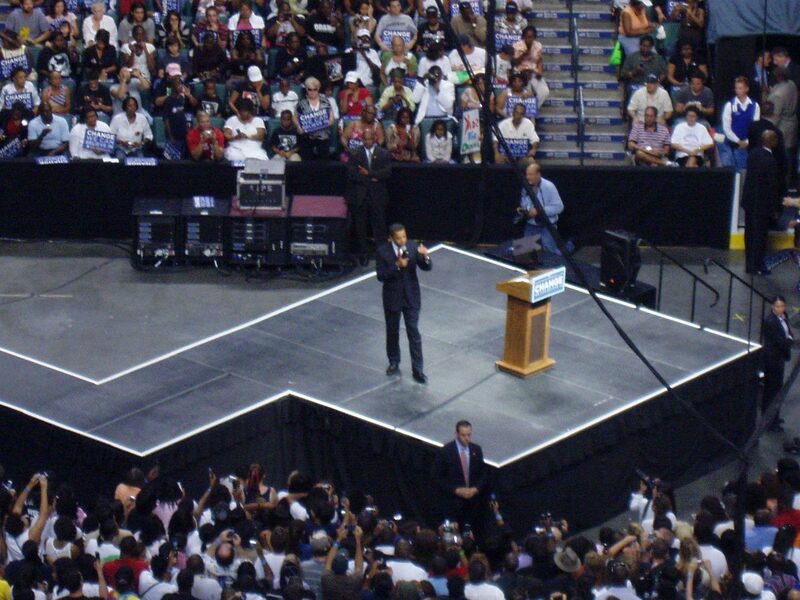 At 10 minutes to 5, Obama was finally introduced. The crowd went wild. The man is a rock star. A politician that can get a reaction like this comes along maybe once a generation. I have heard that Robert F. Kennedy had that kind of reaction. He touched on all the issues including education, Iraq, Afghanistan, oil, jobs, the economy, infrastructure, how the Republicans will try to smear him and divide the country and so on. He spoke well of Senator Clinton and not so well of the policies of Bush, Cheney and McCain. Since I have been paying attention to this campaign for quite a while, nothing he said really surprised me except when he mentioned that Cheney met 40 times with the oil executives. the crowd sat on and cheered every single word. You could feel the electricity of the crowd and I was very glad to be a part of the event. 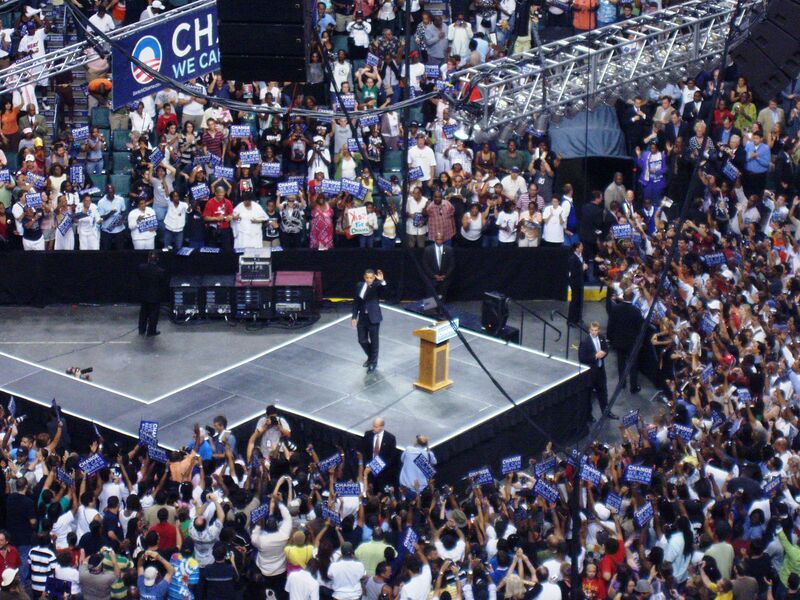 I laughed thinking that Obama was filling an arena while Clinton went to Century Village (a retirement community) and read the next morning that McCain’s fundraiser was moving to a smaller venue. Finally, there were two possible faux pas. · misspeak because the Bank Atlantic Center is located in Sunrise, Florida? Faux pas #2: You decide. This entry was posted in Barack Obama, Election 2008. Bookmark the permalink. Take the ball and run with it!